The USA Basketball women’s national team is almost one with group play in the FIBA World Championship for Women. What are the statistical trends that we have seen so far? The USA Basketball women’s national team has so far played two games in group play and has earned a berth to the quarterfinals in the 2014 FIBA World Championship for Women. Let’s take a look at some statistical trends behind their performance. Shooting efficiency – In both games, Team USA’s effective field goal percentage has been at least 16 percentage points better than the competition. This is the single most influential factor of the Four Factors, and teams that out-shoot their opponents by a very wide margin should win by double digits. Team USA has done that in both games as well. 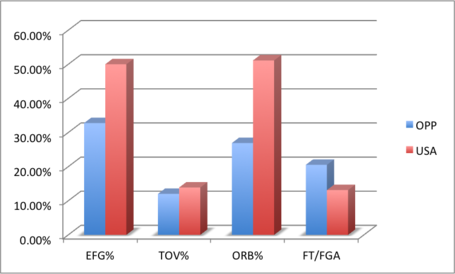 Fast break point scoring – This is not shown in the Four Factors numbers, but Team USA has also outscored both China and Serbia on the break. Against China, Team USA scored 28 fast break points while China only scored 9. Rebounding dominance – The Americans’ rebounding dominance has also played a major factor in their big wins, where they won the overall rebounding battle by at least 18 rebounds in both matches. 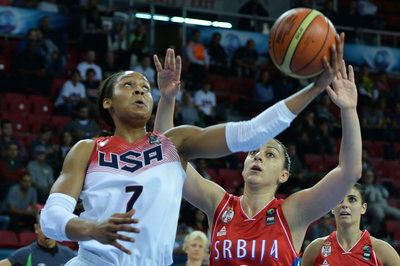 Team USA also doubled up Team Serbia in rebounds, 58-26. The old American guards have trouble guarding the pick and roll – This was most evident with Serbia, where Team USA was unable to contain 25-year old guard Ana Dabovic, where she scored 22 of her 24 points in the first half. theLaplaceDemon and Nate both noted this weakness pretty quickly since the American guards, almost all of whom are 32 or older couldn’t do much, since Dabovic exploited Team USA in the pick and roll game. Even though Dabovic cooled off in the second half, teams with aggressive and speedy guards could give Team USA a run for their money, and besides, they aren’t invincible since they lost to France in exhibition play. Team USA isn’t playing its best defense against other teams in the first half – Even though Team USA has ultimately blown out both of their opponents, they aren’t blowing them out early. This isn’t something that you can see in a box score, but it appears that they are “getting a feel” for the opponent in the first half before making adjustments in the second, and the talent starts to show as well. To some extent, this isn’t exactly Team USA’s fault — the team is made up almost entirely of WNBA players, and the season ended less than a month ago. This team also hasn’t had much time to play together. Furthermore, one player: starting center Brittney Griner only began playing once the World Championships actually started. Other national teams have been practicing and playing exhibitions together for a much longer period of time together, even teams that have a number of WNBA players on the roster like Australia and Brazil. These two defensive concerns ultimately lead to this series of questions — Which of these is a bigger factor behind Team USA’s defensive woes: a lack of personnel to contain the pick-and-roll? Or is Team USA not playing at a high level simply because they haven’t had enough time to gel together? Currently, the Minnesota Lynx forward and reigning WNBA MVP has averaged 16 points, 10 rebounds, and 4.25 assists per game during the World Championships. If Moore can continue to make an impact like she has so far for the rest of the World Championships, she may be the player of the tournament. What other things do you believe Team USA has to do moving forward to be in more of a solid position to have a successful FIBA World Championship run? Let us know in the comments below.